Feed pads are useful tools to keep stock off wet paddocks and provide supplementary feeding. Mac and Lynda Pacey talk about how using a feed pad has helped reduce nitrogen leaching on their dairy farm near Lake Rerewhakaaitu, about 30 kilometres south of Rotorua. Feed pads are a useful tool to keep stock off wet paddocks and provide supplementary feeding. Today we hear how Mac and Lynda Pacey use a feed pad on their farm overlooking Lake Rerewhakaaitu, about 30 kilometres south of Rotorua. Lynda and I bought this farm in 1981. Today we run about 325 cows on 104 effective hectares. My son Mark is our 50:50 share-milker. Along with other farmers in our catchment, we’ve been involved with Project Rerewhakaaitu, trying out ways to cut our nutrient losses while staying in the farming game. On our farm, the feed pad has been a great way to reduce our nutrient foot print. We first built the pad 17 years ago, mainly so we could keep the cows off wet paddocks in the winter. Providing feed was a secondary factor but it made sense to build the concrete feed bins at the same time. We used to feed out maize silage in the paddock in spring and autumn, but there was too much wastage. We decided to put rubber mats down to improve animal welfare as it’s kinder on the cow. After a few years, the long mat sections started to wear and curl at the edges, making them hard to clean. We recently upgraded the pad area beside the shed, using thicker inter-locking ‘jigsaw’ rubber mats. We’re really impressed with these and will eventually get them fitted to the rest of the feed pad. The main soil type on our farm is called Rotomahana mud which is prone to pugging in wet conditions. Pugging reduces pasture re-growth and increases runoff. That runoff can carry sediment, phosphorus and dung which we want to keep out of the lake. The feed pad helps us minimise pugging with the side benefit that we don’t need to graze many cows off the farm in winter, which is a cost saving. I know farmers on more resilient soil types may not need a standoff or feed pad. Each farmer should use their own experience of winter pasture pugging and feed wastage, factor in the nutrient savings and make their own decision. We use the feed pad up to 12 hours a day in winter, holding about 150 cows. We also use the jigsaw mat area for an hour or so after each milking. We’ve only got a small shed so Mark splits the herd into two mobs. All effluent from the pad is captured and goes into our land treatment system, helping us reduce our nitrogen losses. This is all incorporated in our OVERSEER nutrient budgets. The original concrete pad cost about 70 thousand. The two rubber mat upgrades cost about 30 thousand each. We’re pleased with this investment and know that it has helped us look after Lake Rerewhakaaitu. All effluent from the pad is captured and goes into our land treatment system, helping us reduce our nitrogen losses. This is all incorporated in our OVERSEER nutrient budgets.The original concrete pad cost about 70 thousand. The two rubber mat upgrades cost about 30 thousand each. We’re pleased with this investment and know that it has helped us look after Lake Rerewhakaaitu. The OVERSEER nutrient model indicates that the feed pad reduced Nitrogen leaching by 20 percent. The pad and rubber matting cost one hundred and thirty thousand dollars, or one hundred and seventy thousand in today’s dollars. 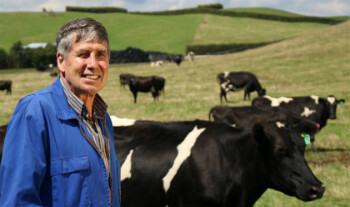 After including the cost of capital, the feed pad increased profit by $420 per hectare at a milk price of six dollars per kilogram of milk solids. There are additional benefits from greater flexibility, improved cow comfort, reduced pugging and less sediment and dung laden run-off. The information provided in this video series is for general guidance only and is not intended as a substitute for farm specific advice. Mitigation tools, technologies and products will continue to evolve. Lake Rotorua catchment farmers can contact BOPRC’s Advice and Support service, or a professional nutrient adviser.